A, Each row represents a form of multitasking based on a combination of 2 or 3 of the following categories: direct patient care (DPC), indirect patient care (IPC), and education. Vertical lines within each row represent a 1-second interval within a 24-hour period. The intensity of the color represents the proportion of observed interns in a specific 1-second interval who were engaged in multitasking by completing 2 or more simultaneous activities (range, 0%-12% of observed interns). B, Each row represents a form of multitasking based on a combination of 2 of the following categories (all subgroups of IPC): communicating with nonteam members (Comm Nonteam), communicating with team members (Comm Team), interacting with medical record (Recording), and viewing image, electrocardiogram, pathology report, or other (Viewing Images). Vertical lines within each row represent a 1-second interval within a 24-hour period. The intensity of the color represents the proportion of observed interns in a specific 1-second interval who were engaged in multitasking by completing 2 simultaneous activities (range, 0%-20% of observed interns). Institute of Medicine. Graduate Medical Education That Meets the Nation’s Health Needs. Washington, DC: National Academies Press; 2014. Rabe-Hesketh S, Skrondel A. Multilevel and Longitudinal Modeling Using Stata. 2nd ed. College Station, TX: Stata Press; 2008. Association of Program Directors in Internal Medicine. APDIM Survey 2011. https://www.im.org/data/apdim-surveys. Accessed March 11, 2019. Question How do current first-year internal medicine residents (interns) allocate time during inpatient training? Findings In this secondary analysis of a cluster-randomized trial including 80 interns, participants spent more time caring for patients indirectly (eg, recording their work) than interacting with patients or in dedicated educational activities. Direct patient care or education frequently occurred when interns were simultaneously performing indirect patient care. Meaning These findings provide a comparison with historical trends and a baseline measure for future efforts designed to improve the workday structure and experience of internal medicine trainees. Importance The United States spends more than $12 billion annually on graduate medical education. Understanding how residents balance patient care and educational activities may provide insights into how the modern physician workforce is being trained. Objective To describe how first-year internal medicine residents (interns) allocate time while working on general medicine inpatient services. Design, Setting, and Participants Direct observational secondary analysis, including 6 US university-affiliated and community-based internal medicine programs in the mid-Atlantic region, of the Comparative Effectiveness of Models Optimizing Patient Safety and Resident Education (iCOMPARE) trial, a cluster-randomized trial comparing different duty-hour policies. A total of 194 weekday shifts were observed and time motion data were collected, sampled by daytime, nighttime, and call shifts in proportion to the distribution of shifts within each program from March 10 through May 31, 2016. Data were analyzed from June 1, 2016, through January 5, 2019. Main Outcomes and Measures Mean time spent in direct and indirect patient care, education, rounds, handoffs, and miscellaneous activities within a 24-hour period and in each of four 6-hour periods (morning, afternoon, evening, and night). Time spent multitasking, simultaneously engaged in combinations of direct patient care, indirect patient care, or education, and in subcategories of indirect patient care were tracked. Results A total of 80 interns (55% men; mean [SD] age, 28.7 [2.3] years) were observed across 194 shifts, totaling 2173 hours. A mean (SD) of 15.9 (0.7) hours of a 24-hour period (66%) was spent in indirect patient care, mostly interactions with the patient’s medical record or documentation (mean [SD], 10.3 [0.7] hours; 43%). A mean (SD) of 3.0 (0.1) hours was spent in direct patient care (13%) and 1.8 (0.3) hours in education (7%). This pattern was consistent across the 4 periods of the day. Direct patient care and education frequently occurred when interns were performing indirect patient care. Multitasking with 2 or more indirect patient care activities occurred for a mean (SD) of 3.8 (0.4) hours (16%) of the day. Conclusions and Relevance This study’s findings suggest that within these US teaching programs, interns spend more time participating in indirect patient care than interacting with patients or in dedicated educational activities. These findings provide an essential baseline measure for future efforts designed to improve the workday structure and experience of internal medicine trainees, without making a judgment on the current allocation of time. Understanding how residents spend their time is important because of the likely effect of these activities on the quality and function of the physician workforce and because the United States spends $12 to $14 billion annually on residency training.10,11 We present data from direct time-motion observations of interns at 6 internal medicine training programs randomized within in the individualized Comparative Effectiveness of Models Optimizing Patient Safety and Resident Education (iCOMPARE) trial, a cluster-randomized trial comparing 2 different duty-hour policies during the 2015-2016 academic year.12 A previous study13 reported no differences between duty-hour policy groups in time spent in direct patient care or education as 1 of 4 prespecified hypotheses from the trial pertaining to trainee education; herein we report more detailed descriptions of time allocation to patient care, educational activities, and multitasking. Because the policy groups did not differ on time spent in different activity categories, we aggregated and analyzed time-motion data across all interns from the 6 training programs to comprehensively describe how interns spent their time on general medicine inpatient services. We then examined data from 4 periods of the day (morning, afternoon, evening, and night) to explore variations in how time was spent throughout the day. Finally, we quantified the proportion of time spent multitasking. Time-motion data were collected from March 10 through May 31, 2016. The iCOMPARE programs were randomized to the 2011 Accreditation Council for Graduate Medical Education (ACGME) duty-hour policies (standard arm) or more flexible policies (flexible arm) that did not specify shift length limits or mandated lengths of time off between shifts for interns (eFigure 1 in the Supplement).12,13 Participating programs included university-affiliated and community hospital training programs. Six programs, 3 in each policy group, were recruited for the time-motion substudy. The study was approved by the institutional review board at the University of Pennsylvania. All participants provided written informed consent. Time-motion study programs were located in the mid-Atlantic region to facilitate in-person training of observers and ongoing monitoring of quality across multiple programs during the observation period. Each observer was assigned to 1 intern at a time and was scheduled so that an intern’s entire shift was observed while the intern was working on an inpatient general medicine (ie, nonspecialty) rotation. Observed shifts were limited to shifts starting on a weekday (Monday-Friday) and included daytime (short and long shifts as defined by the training program), nighttime, and call shifts (defined by the training program and typically lasting more than 14 hours). The proportion of shift types observed at each program reflected the program-specific distribution of shifts in terms of shift length and overnight schedules to capture a typical 24-hour weekday for each program. For example, for a given general medicine rotation (ranging from 2 weeks to 1 month) at a specific training program, if interns spent two-thirds of their rotation working day shifts and one-third working night shifts, the ratio of day to night shifts scheduled for observation at that program approximated 2:1. Programs had a variety of shift types with varying start and stop times (eFigure 3 in the Supplement). Interns rotating on the general internal medicine inpatient service at 6 mid-Atlantic teaching programs during the time-motion study period were eligible for observation. Interns, as opposed to more senior residents, were chosen for time-motion data collection because the 2 duty-hour policies studied in the iCOMPARE trial had different rules for intern shifts and different work hours for interns, and, generally speaking, interns are the primary, patient-facing physicians for patients receiving care from resident teams in teaching hospitals. Interns were recruited individually and in group settings (eg, during teaching conferences), and in person at each program. Among the 129 interns invited to participate, 120 (93.0%) consented, and 80 were included because they were on a general medicine service when observers were available. We did not record why interns chose not to participate. Data were collected by 23 observers (including A.M.Y. and J.M.A.). Observers received 4 hours of in-person training to collect data without interfering in interns’ daily workflow and to categorize interns’ activities based on prespecified categories (see below) using a custom-built tablet-based software (eFigure 2 in the Supplement). We used 2 processes to assess observation reliability. First, after training was completed, each observer recorded activities observed while watching an 8-minute video of actors performing the predefined activities. The median κ coefficient among pairs of observers during training was 0.67. Second, during the study period, 10% of shifts were simultaneously observed by 2 observers. The median κ coefficient among paired observers during the study was 0.74. The observer began recording activities when the intern arrived at the hospital and stopped when the intern finished their clinical duties for that shift. Shifts longer than 12 hours were typically split between 2 observers; precise split times were coordinated between observers based on their available schedule. As a quality check, we measured expected observation time based on interns self-reporting their arrival and departure times. In total, 97.7% of the total time expected to be observed was observed. Activities were assigned to 7 major categories (Table 1), adapted from prior time-motion trials.3,5 The 7 major categories of activities were split into the following 2 sections: (1) the required section that indicated how an intern’s shift may be subdivided (ie, activities related to education, rounds, work, and handoffs), where at least 1 of 4 categories had to be recorded on the software or else a warning message would appear; (2) a not-required section that included direct patient care, indirect patient care, and miscellaneous (ie, nonpatient or nonclinical activities such as going to the restroom, eating, or sleeping). The not-required section activities were recorded as they occurred. The required section was purposefully incorporated to avoid unrecorded blank periods that could be interpreted as the intern not engaged in any activity or the observer forgetting to record. Three of the major categories—education, direct patient care, and indirect patient care—had subcategories. Data were analyzed from June 1, 2016, through January 5, 2019. We used a granular approach to characterize time allocation to specific activities. For each second of a 24-hour day, we calculated the proportion of interns engaged in a specific activity by totaling the number of interns who were observed engaged in that activity and then dividing by the total number of interns who could have been observed during that period. For example, to calculate the proportion of interns spending time in direct patient care from 1:00:01 to 1:00:02 pm, we divided the total number of interns observed in direct patient care during that specific 1-second period by the total number of interns who were observed during that 1-second period (ie, an observer was on site). We repeated this procedure for every second of a 24-hour period for every recorded activity and then summed each second to a desired interval length, such as a 6-hour or a 24-hour period. When the percentage of interns engaged in a particular activity is summed across a set period and divided by that interval, each second is adjusted by the number of interns available to be observed. The summed value represents the mean proportion of time spent in a particular activity across all 6 training programs. This granular approach prevents oversampling of interns’ time, adjusting for time when they were not at work (ie, not observable) during a set interval. We report the mean (SD) number of hours engaged in any recorded activity except work because direct and indirect patient care and their subcategories provide a more detailed description of work-related activities. We parsed our measurements based on the following 4 periods of the day: (1) morning (6 am to 12 pm), (2) afternoon (12 pm to 6 pm), (3) evening (6 pm to 12 am), and (4) night (12 am to 6 am). Clustering within programs was reflected using multilevel mixed-effects models with restricted maximum likelihood estimations using a random intercept for each program cluster.14 We calculated mean repeated observations of specific individuals occurring during the same time of day, accounting for within-person correlations A 2-sided P value of <.05 was considered statistically significant. All analyses were conducted using Stata software (version 14.1; StataCorp, LLP). A total of 80 interns from 6 mid-Atlantic teaching programs were observed for 2173 hours. Forty-four (55.0%) of the interns were men, and 36 (45.0%) were women (mean [SD] age, 28.7 [2.3] years), 38 (47.5%) identified as white, and 30 (37.5%) identified as Asian (Table 2). We observed a median of 10.5 hours per shift (interquartile range [IQR], 9.6-12.5 hours). Among the 194 shifts observed, 120 (61.9%) were short daytime shifts (median length of observed time, 9.9 hours; IQR, 9.2-10.5 hours); 33 (17.0%) were long daytime shifts (median length of observed time, 12.2 hours; IQR, 11.0-12.6 hours); 35 (18.0%) were nighttime shifts (median length of observed time, 13.6 hours; IQR, 11.8-13.9 hours); and 8 (4.1%) were overnight call shifts (median length of observed time, 20.9 hours; IQR, 16.7-26.7 hours). A mean (SD) of 15.9 (0.7) hours was spent in indirect patient care, reflecting 66% of the day (Table 3) that was mostly interns interacting with the patient’s medical record or recording their work (10.3 [0.7] hours), followed by communicating with core team members (5.9 [0.5] hours) and communicating with nonteam members about patients (3.3 [0.5] hours). Little time was spent viewing radiology images, electrocardiograms, or pathology results (0.3 [0.0] hours). The next most frequently observed activities were rounds (5.0 [0.6] hours; 21% of the day) and direct patient care (3.0 [0.1] hours; 13% of the day), which consisted mostly of communicating with patients (2.6 [0.1] hours). These observed activities were followed by educational activities (1.8 [0.3] hours; 7% of the day), consisting primarily of educational conferences (1.1 [0.2] hours). The least amount of time was spent handing off patient care responsibilities (0.8 [0.2] hours; 3% of the day). With a few exceptions, the amount of time spent engaged in particular activities was consistent throughout the day (Table 3). Indirect patient care was the predominant activity during each of the 6-hour time periods (mean [SD] range, 3.3 [0.4] to 4.2 [0.2] hours). Afternoons revealed the least amount of time in direct patient care but the most in education. During evenings and nights, marginally greater time was spent in direct patient care compared with the afternoon period, and very little time was spent in educational activities. When multitasking did occur, the combination of direct and indirect patient care (mean [SD], 0.7 [0.1] hours; 3% of the day) and indirect patient care combined with education (0.5 [0.1] hours; 2% of the day) were the most common (Figure, A, and eTable 1 in the Supplement). Viewed another way, a substantial portion of the time spent in direct patient care or educational activities occurred while performing indirect patient care. Across a 24-hour period, 23% of all direct patient care and 28% of educational activities occurred simultaneously when interns were engaged in indirect patient care. Simultaneous activities in subcategories of indirect patient care were also frequent (Figure, B, and eTable 2 in the Supplement). In particular, interacting with the medical record while communicating with medical teams was the most common, occurring a mean (SD) of 2.1 (0.2) hours (9%) of the day. Multitasking with 2 or more indirect patient care activities occurred for a mean (SD) of 3.8 (0.4) hours of the day (16%). Our findings from the largest multi-institutional time-motion study of internal medicine interns, to our knowledge, provides an updated snapshot of an intern’s experience in the hospital. Interns are predominantly engaged in indirect patient care, with little variation over 24 hours. Notably, more than 10 hours (43%) of a 24-hour period were spent interacting with the electronic medical record. In contrast, little time was spent in educational activities or direct patient care. When interns were engaged in these activities, indirect patient care often co-occurred. Internal medicine interns in our study spend a small proportion of time directly engaged with patients. In the 1990s, 25% of inpatient time was spent engaging with patients.6 Time-motion studies from 2010 to 2012 observed that the proportion had dropped to 9% to 12%.3-5 Our finding that 13% of observed time was spent in direct patient care is consistent with these findings. We add to these studies, first, by describing what occurs in the evenings and nights, whereas prior studies have mostly observed daytime activities.3-5 We found little difference in how time is allocated in the evenings and nights compared with the daytime. If anything, fewer hours are spent at patients’ bedsides relative to the morning period, and the least amount of educational activities was observed in the evening and night. These findings may concern educators because dedicated nighttime shifts have become more common after programs adapted to the ACGME’s 2011 duty-hour regulations.15,16 Efforts to enhance the educational experiences at night may be warranted. Second, we provide measures of multitasking, which few studies of training programs have included.3,5 Multitasking is important to understand because it may reflect residents trying to compress their clinical and educational demands into a finite number of hours.17,18 Multitasking episodes may be challenging in learning environments because time spent engaged in multiple activities may be less efficient than focusing on each activity separately.19 In addition, although prior studies have measured multitasking as the co-occurrence of any activity,4 we measure and provide more targeted definitions of multitasking. Without a consensus definition of multitasking, we chose to report what we believe is most informative for policy makers, accreditation bodies, and educators20-22: (1) the overlap among the 3 major activities of direct patient care, indirect patient care, and education and (2) co-occurring indirect patient care activities. Although time spent multitasking could be interpreted as modest, whether it occurred too frequently or infrequently should be gauged by measures of interns’ educational experience and how the quality of patient care was affected, which we do not measure. How the medical community responds to these observations will be important moving forward. As trainees report high rates of burnout and depression early in their career,23,24 understanding how their workday affects their health and well-being may be an important next step.25-31 If the allocation of time, including multitasking, is causally related to the propensity of trainees to develop burnout and depression, then our findings provide a critical baseline from which the medical community can judge future efforts designed to improve the work environment for internal medicine trainees. Our study has several limitations. First, we limited our study to internal medicine interns. The distributions of activities of interns in other fields, such as surgery or psychiatry, are likely to be different, although many non–internal medicine residents spend a significant portion of their first year rotating on internal medicine inpatient services. Second, our study observed interns at 6 training programs, potentially limiting its generalizability. Nevertheless, we observed 2 and a half times as many hours of intern time and included 3 times as many programs as the next largest time-motion study in the United States.3 Third, we observed interns only during general medical inpatient rotations. Although these rotations are arguably the defining experience of a medicine internship, medical interns spend many months in other settings. Finally, these results are descriptive. We can observe how interns spend their time and we can compare that with distributions from the past, but no established standards identify what distribution of activities is best for the educational experience of interns or the quality of care patients receive. This analysis of time-motion data from a large cohort of interns across multiple US training programs reveals that interns spend substantial time in indirect patient care and little in face-to-face contact with patients or engagement in educational activities. Concluding that this distribution is a problem might be easy, reflecting an appealing and perhaps nostalgic view that the best way to care for patients and the best way to learn from them is with personal contact. A more agnostic view is that even if face-to-face engagement is essential, more may not be necessary given that so much of patient care now occurs in teams, is informed by diagnostic test reports, and is mediated through the work of others. Our results suggest those realities define how medical interns spend their time, and although we cannot be sure whether that is good or bad, our findings provide an essential baseline measurement for future efforts designed to improve the workday structure and experience of internal medicine trainees. Accepted for Publication: January 11, 2019. Open Access: This is an open access article distributed under the terms of the CC-BY License. © 2019 Chaiyachati KH et al. 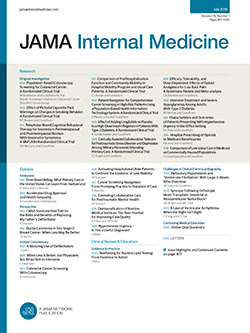 JAMA Internal Medicine. Corresponding Author: Krisda H. Chaiyachati, MD, MPH, MSHP, General Internal Medicine, University of Pennsylvania Perelman School of Medicine, 423 Guardian Dr, 1313 Blockley Hall, Philadelphia, PA 19104 (kchai@pennmedicine.upenn.edu). Author Contributions: Dr Chaiyachati had full access to all the data in the study and takes responsibility for the integrity of the data and the accuracy of the data analysis. Concept and design: Chaiyachati, Shea, D. Asch, Bellini, Sternberg, Yeager, J. Asch, Desai. Drafting of the manuscript: Chaiyachati, Shea, Liu, Desai. Critical revision of the manuscript for important intellectual content: Chaiyachati, Shea, D. Asch, Bellini, Dine, Sternberg, Gitelman, Yeager, J. Asch, Desai. Statistical analysis: Chaiyachati, Liu, Dine, Sternberg. Obtained funding: Shea, D. Asch, Sternberg. Administrative, technical, or material support: Chaiyachati, Shea, Bellini, Sternberg, Gitelman, J. Asch, Desai. Supervision: Chaiyachati, Shea, D. Asch. Conflict of Interest Disclosures: Dr Shea reported receiving grants from the National Institutes of Health (NIH), National Heart, Lung, and Blood Institute (NHLBI), and Accreditation Council for Graduate Medical Education (ACGME) during the conduct of the study. Dr D.A. Asch reported receiving grants from the NHLBI and the ACGME during the conduct of the study and personal fees from and part ownership of VAL Health outside the submitted work. Dr Sternberg reported receiving grants from the NHLBI during the conduct of the study. Dr Desai reported serving on the Review Committee for Internal Medicine for the ACGME and recused himself from all decisions this committee made related to the individualized Comparative Effectiveness of Models Optimizing Patient Safety and Resident Education (iCOMPARE) trial. No other disclosures were reported. Funding/Support: The iCOMPARE trial is supported by grants U01HL126088 and U01HL125388 from the NHLBI and grants from the ACGME. Additional Contributions: The iCOMPARE research group provided guidance in the initial planning phases of the time-motion substudy. Anjala Tess, MD, Beth Israel Deaconess Hospital, Boston, Massachusetts, allowed us to use a standardized video of morning rounds when training observers for our study. Additional Information: A copy of the Association of Program Directors in Internal Medicine 2011 survey results is available from the authors on request.